Last week Petra Clark's article in the September issue of the Journal of Victorian Culture was mentioned: '"Cleverly Drawn": Oscar Wilde, Charles Ricketts, and the Art of the Woman's World' (it can be downloaded from Journal of Victorian Culture Online). It is assumed, by scholars such as J.G.P. Delaney and David Peters Corbett, that Wilde and Ricketts met before 1889, when, according to Ricketts Wilde had been sent a copy of Ricketts's and Shannon's magazine The Dial. It seems logical to state that they must have met before that, and to find a possible reason for a meeting in the drawings Ricketts had done earlier for The Woman's World during Wilde's editorship. In Oscar Wilde. Recollections (1932, p. 28) Ricketts recalled: 'A copy sent to Wilde brought him to the house I shared with Charles Shannon in the Vale, Chelsea.' Ricketts does not mention an earlier meeting. He then says, 'I had imagined him a younger man - do not forget at that time only his volume of 'Poems', 'The Happy Prince' and a few articles had appeared.' The memories of Wilde were, of course, written late in Ricketts's life (and published posthumously), but the details seem to be convincing, and from them it may be gathered that Ricketts and Wilde (and Shannon) met for the first time after sending The Dial. In fact, that is what Ricketts remembered: '[...] my first meeting in 1889, which I have described' (p. 38). There is no reason to assume that Wilde and Ricketts met earlier, simply on the basis of the drawings Ricketts did for The Woman's World. Magazine editors did not work like that. True, since June 1888, Wilde and Ricketts shared a publication space, but there was no need for them to meet each other, or even correspond. What was Wilde's role as an editor? Petra Clark quotes part of a letter that Wilde wrote to Wemyss Reid (1842-1905), early 1887. 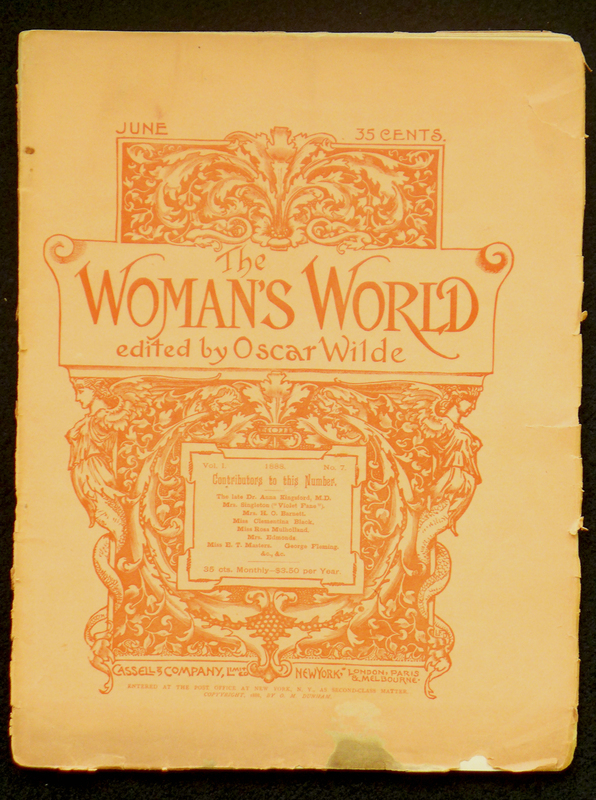 Reid was a manager at Cassell & Company, the publishers of The Lady's World that was relaunched as The Woman's World under Wilde's editorship in 1888. Indeed, Wilde suggested that the magazine should open with literature, art, travel, and social studies: 'let dress have the end of the magazine'. His complaint about some articles being only thinly disguised advertisements did not refer to the actual advertisements that Cassell needed as an extra source of income. And they were not abolished at all. 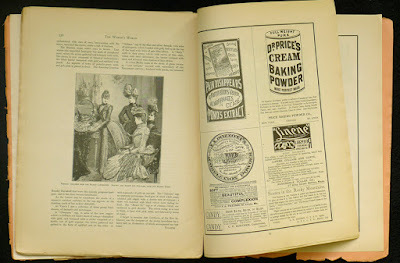 Each issue of The Woman's World contained advertisements for non-literary and mundane products such as soap, baking powder, 'linene collars and cuffs', 'medicinal food', beauty cream, 'corset waists', and railways, alongside Cassell's own advertisements for new publications. 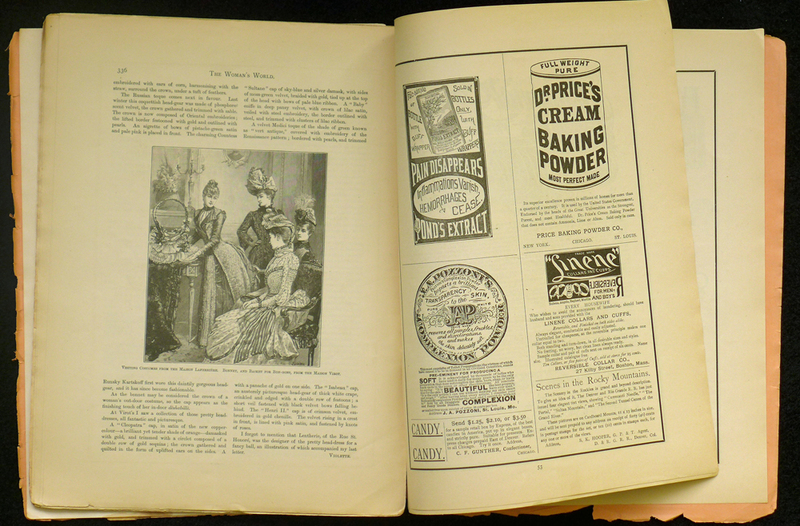 Clark may have missed these advertisements, as libraries used to discard the covers and advertisements when the issues were bound up, and, also, because Cassell & Company offered yearly bound volumes of The Woman's World (advertised each December) and in these the advertisement leaves were also removed. 'It seems to me', wrote Wilde, 'that just at present there is too much money spent on illustrations, particularly on illustrations of dress. They are also extremely unequal, many are charming [...] but many look like advertisements, and give an air to the magazine that one wants to avoid, the air of directly puffing some firm or modiste. A new cover also would be an improvement.' (The Complete Letters of Oscar Wilde, 2000, p. 298). The magazine got a new cover, as Clark writes: 'no longer did the magazine bear the former green cover of the Lady's World, which featured an "idealized goddess" vainly gazing at her reflection in a mirror, for the cover of the Woman's World sported "a William-Morris-type spray of leaves" and "serpentine women with sensuous chests", done in red ink on a pinkish ground. (The quotes are from an article by Laurel Brake, 'Oscar Wilde and The Woman's World', 1994). The new cover was signed by L.F.D., and designed by the Arts and Crafts decorator Lewis Foreman Day (1845-1910), who had worked for Cassell's before. Clark writes that 'Wilde made an implicit effort to align the appearance of the Woman's World more closely with Arts and Crafts publications such as the Century Guild Hobby Horse than with other mass-market magazines'. I think that this may have been Wilde's intention, but it was not his decision. That was left to the publishers and the managers. If we re-read Wilde's letter carefully, we see what he says about the illustrations and the cover. He wrote, in much more detail, about the literary contents of the magazine and went out of his way to mention possible future authors of articles. He mentions almost thirty names of new literary collaborators, but does not mention one artist, let alone an artist for the cover design. He may have had ideas about the art contents, but he did not ventilate them, and was not asked to do that. Wilde was not asked to be its new editor-in-chief, but its literary editor, as he mentions in quite a few letters that he wrote to future collaborators: 'I have been asked to become literary adviser to one of the monthly magazines' (letter to Louise Chandler Moulton), 'I have been asked to become the literary adviser of one of Cassell's monthly magazines' (letter to Minnie Simpson), 'It is for a magazine of Messrs Cassell's to which I am a sort of literary adviser' (letter to Phoebe Allen). There are some letters that state that he is asked 'to edit' the magazine (letters to Julia Ward Howe and to Eleanor Sidgwick), which may leave some room for a wider interpretation of his function. I believe that Wilde's initial answer to Reid should be taken for what it is: he was to be the literary editor of a magazine that for the rest would be managed by Cassell's managers. In some letters Wilde asked if an article was in need of illustrations: 'The article will be illustrated as you may direct' and 'Would you, however, desire it to be illustrated? If so, it would be necessary to get it done as soon as possible' (letters to Phoebe Allen), or: 'We should set about the illustrations at once.' (letter to Violet Fane). This suggests that Wilde worried over the illustrations, but left it to the authors to suggest the subjects for the illustrations. He did not decide upon the illustrations himself, nor on the names of the illustrators. He did not make any suggestions other than work should be started on time in order to ensure that the issue would not be held up. Now and then he made simple suggestions for a frontispiece portrait of the author or of a painting to go with an essay about a particular artist: 'We might also have for the frontispiece of the magazine an engraving of a good Jan Steen or any other picture you might care to select.' In a letter to Oscar Browning Wilde writes: 'If you send me the photographs I will get them reproduced at once, so as to have no delay about the publication.' Soon after, Wilde complained to John Williams, assistant chief editor of Cassell's, that 'I find that without a staff of some kind a magazine with special illustrated articles cannot get on' (October 1888). He was to be assisted by Arthur Fish. In his last letter to Wemyss Reid he writes: 'I am specially indebted to Mr Bale, whose artistic knowledge and experience have always been at my disposal'. Only one letter to Edwin Bale has survived: 'Dear Mr Bale, I send you the photographs of Lady Archibald Campbell - one for frontispiece, two for setting into the article. Also three drawings by Godwin to be set into the text - like marginal sketches.' Bale was a watercolourist who worked for Cassell as Art Director between 1882 and 1907. 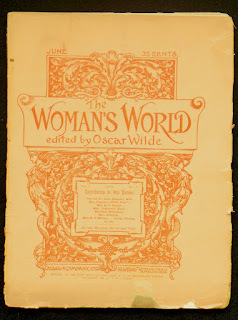 Wilde did not suggest a name for the artist who designed the new cover for The Woman's World. 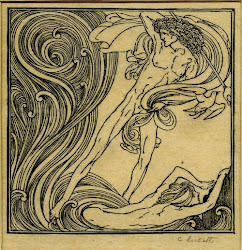 The commission for drawings that Charles Ricketts received form the editors of The Woman's World were not dependent on Wilde's intervention or judgment, and therefore Ricketts will not have sent them to Wilde, but to the Art Director. What really happened? See next week's blog.